We launched a huge upgrade to Telerivet this week, with several new features that make it easier than ever to manage and engage your organization’s mobile messaging contacts. While the new search box looks the same as before, it’s much more powerful under the hood. 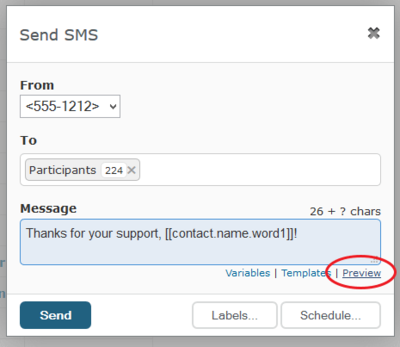 The search box on the Contacts page now searches within the full text of all contact fields, including name, phone number, and all custom fields. In particular, you can now search for any sequence of 3 or more digits any within the contact’s phone number. It’s not necessary to match the exact formatting of the contact’s phone number. Also, if you store the contact’s full name in Telerivet, it’s possible to search for contacts by either first or last name. Full-text search also means that Telerivet is much better at auto-completing contact names and phone numbers whenever you compose a new message. Even if your organization has hundreds of thousands of contacts, searching your contacts is practically instantaneous. The new Contacts page makes it easy to filter and segment your contacts by a variety of conditions — for example, to find new contacts created in the past few days; active contacts that have sent messages recently; or inactive contacts that may need further outreach. 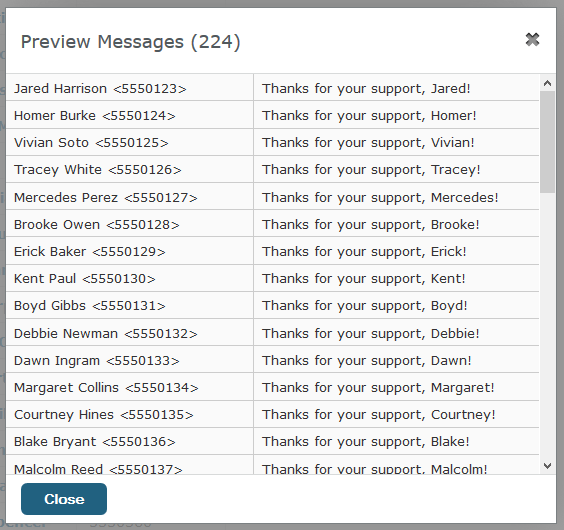 Simply click “Filter” and select your conditions, like the number of messages sent or received, the last time you contacted them or heard from them, and any custom variables. If you often need to segment contacts matching a particular set of filter conditions, you can save your filter as a Dynamic Group — for example, new contacts, active contacts, or inactive contacts. 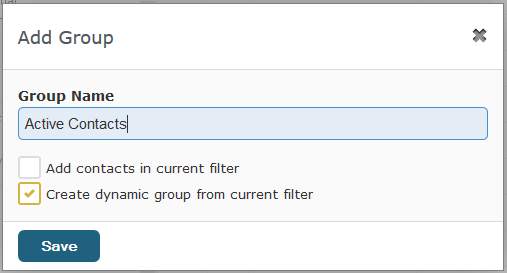 First, define a filter, then click “Add Group” and select “Create dynamic group from current filter”. Also, it’s possible to import contacts into different groups – just import a “Groups” column with a list of group names separated by commas. It is now possible to prevent Telerivet from sending messages to particular contacts. For example, you can block sending messages to contacts who text “STOP” to unsubscribe, or contacts who abuse your SMS system. You can manually select block/unblock contacts from the “Actions” menu, or block contacts automatically from the Rules Engine, API, or a subscription service. Telerivet displays blocked contacts with a red line through the middle. When you send a message to a group containing any blocked contacts, Telerivet will automatically skip the blocked contacts. Telerivet now supports storing custom Date/Time fields for your contacts, so you can easily keep track of the exact time when contacts trigger an event. If you use the Rules Engine, you can set a Date/Time variable to the value [[time]]. If you use Telerivet to conduct an SMS poll, you typically have one group of contacts that was invited to participate in the poll (the sample), and a smaller group of contacts that actually participated in the poll (the respondents). Now it’s also possible to see the non-respondents: contacts in the sample group that are not in the respondents group — for example, if you want to send them a reminder to complete the poll. Simply select a group, then click “Non-Members” to see the contacts that are not in that group. You can choose whether to show all non-members, or only non-members that are members of another group. 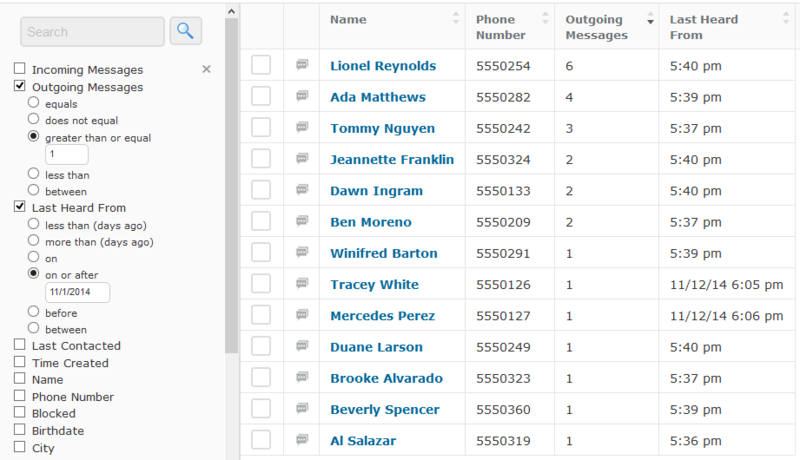 Groups can automatically keep track of the date/time when each contact joined the group. This is particularly useful for subscription services – you can keep track of the time each contact subscribed, and then schedule a series of messages to each contact a certain number of days after they joined. 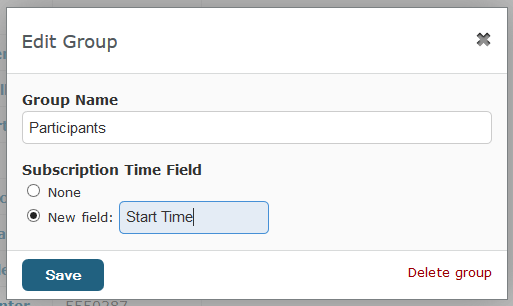 To enable this functionality, click the settings icon for your group, then choose which contact field will store the subscription time for that group. Need to update a field for a bunch of contacts at once? 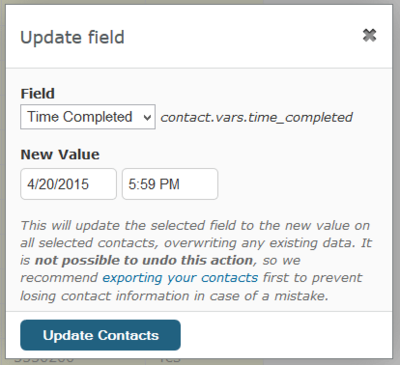 Just select the contacts and click Actions > Update field. When sending messages with variables like [[contact.name]] or [[contact.vars.example]], you can see what the variables will look like before you click “Send”. Just click the “Preview” link and we’ll show exactly what the messages will look like for up to 50 contacts. To explore the new ways your organization can use Telerivet’s contact management tools, head over to your Contacts page now! As always, let us know if you have any questions or feedback, and feel free to email us at support@telerivet.com .